Hi guys, If you want to find Free Popular WordPress Themes for your WordPress website. Then you come to the right place here. Thousands of free WordPress themes are available But, I’ve collected classic collections that will help to create one of the most viral websites. This is a perfect solution for all your needs. All Free WordPress Themes are easy to use, user-friendly WordPress theme. You can choose a topic and you will be well on the way to creating a good website. North Shore is a redesigned look for the multipurpose theme CityLogic. 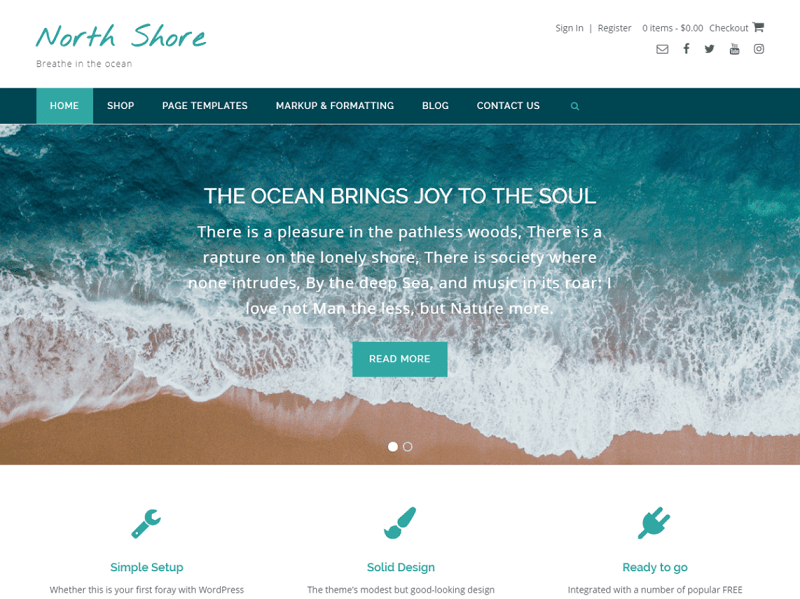 North Shore’s modest but eye-catching design makes it a great choice for creating any website from travel to business to food, decor, lifestyle, sport and more. The ability to have a transparent header allows the use of bold homepage imagery by displaying either a static header image or slider – with the choice of using the built-in slider or any 3rd party slider plugin of your choice. North Shore integrates seamlessly with a number of popular FREE plugins such as WooCommerce, Contact Form 7 and Recent Posts Widget Extended. 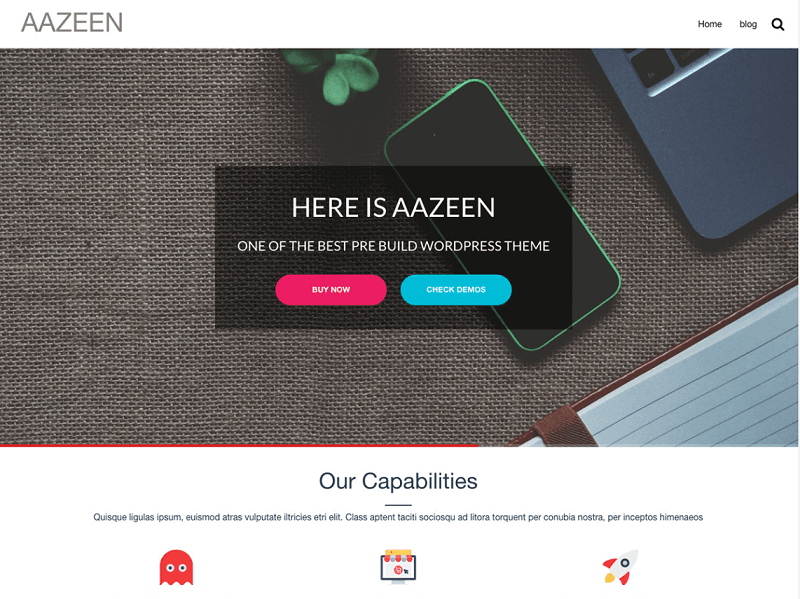 Aazeen WordPress theme contains everything you need: professional design homepage, 10+ Preset homepage, 10+ Preset pages and you can import any page with a single click. This theme is compatible with a most popular plugin: SiteOrigin Page Builder. This Plugin is easy to use drag and drop page builder that will help you to create any layout you can imagine fast and easy. This theme offers wonderful features and functionalities to launch successful fundraising campaigns for individuals, companies, agencies, and different businesses. No coding skills required! 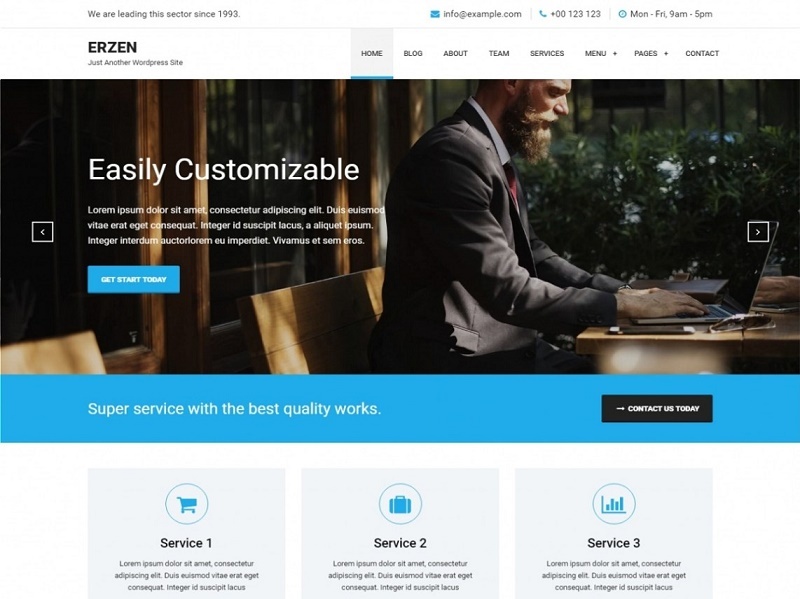 Erzen is the perfect theme for your Web project. Very Lightweight and easily customizable, it fits for any type of website such a blog, corporate, portfolio, business finance, startup website and WooCommerce storefront with a clean and professional design. Erzen is SEO Friendly, Load fast, Responsive, WPML, Retina ready, RTL & translation ready. Support Front page with service section, Blog Section, about Section & slider section. You can edit the settings on mobile And on a tablet so your site looks great on every media device. Work with the most popular page builders as Visual Composer, Elementor, SiteOrigin, Beaver Builder, Divi, etc. 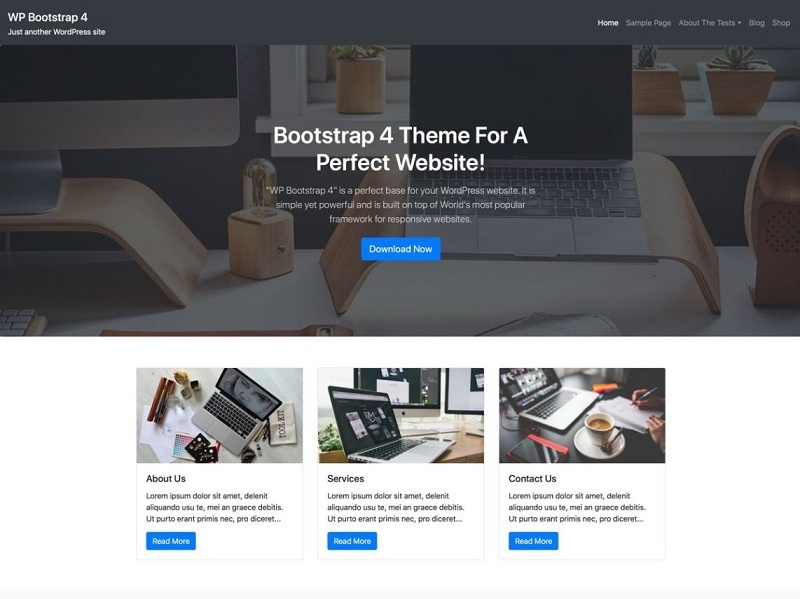 WP Bootstrap 4 is a simple & easy to use WordPress theme. It is based on the world’s most popular framework for responsive websites, Twitter Bootstrap 4. “WP Bootstrap 4” is a perfect combination of Bootstrap 4 and WordPress. It is fast and light-weight with around 20 kb style.css. It is also search engine friendly. It has a built-in slider for featured posts on blog’s home page. It supports all major & popular WordPress plugins like Jetpack, Contacts Form 7, Beaver Builder, SiteOrigin Page Builder etc. 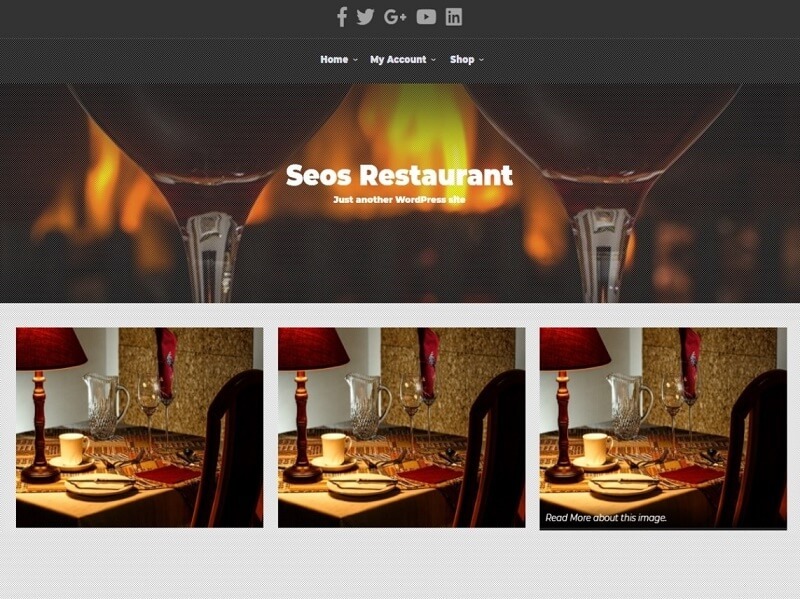 Seos Restaurant is clear, easy to customize WP template. Seos Restaurant is a modern multi-purpose HTML5 theme with a responsive 2 column layout. The theme includes the most popular 29 social icons, sidebar custom width and sidebar position, custom images and frontpage boxes. is excellent for a restaurant, eatery, newspaper, images, photos, publishing, news, blog, business, portfolio or other editorial websites. To learn more about the theme please go to the theme URI and read the documentation. 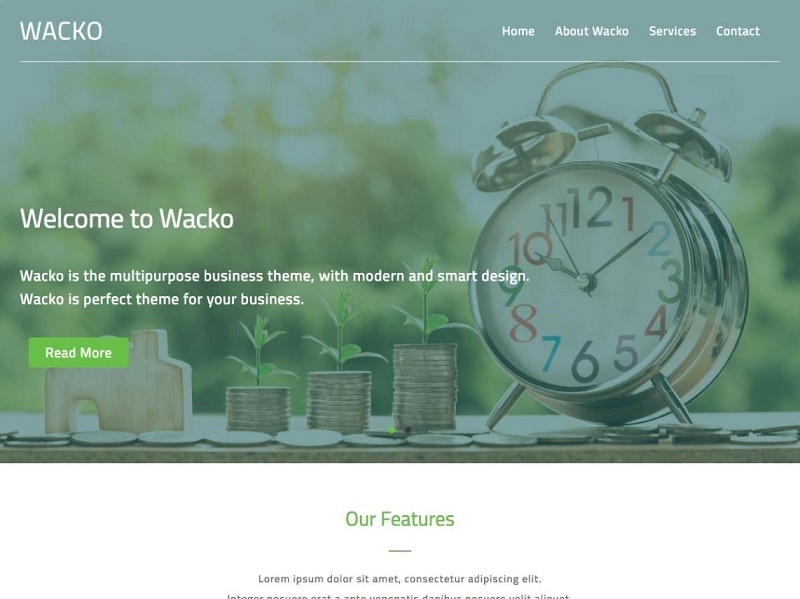 Wacko is a clean, responsive theme that’s versatile and easy to use. Suitable for both corporate and creative businesses, the design of this elegant theme gives you maximum flexibility. One of the best free popular WordPress themes. Wacko is compatible with most popular plugins like Contact Form 7, Jetpack and many more. Wacko has definitely been designed with business owners in mind. With an intuitive design and user-friendly theme options, building your business website can be a breeze. 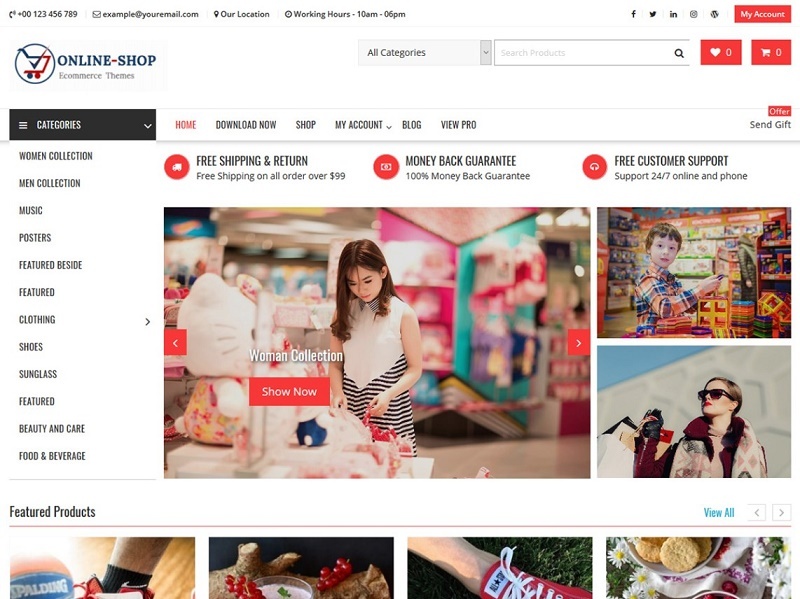 Online Shop is a powerful, dynamic and highly customized WordPress multipurpose e-commerce theme. Online shop comes with a broad array of features, highly customized options, and advanced custom widgets to create any kinds of online eCommerce sites. One of the best free popular WordPress themes. The theme has limitless possibilities to create your online store unique and beautiful. Whether you are creating or redesigning fashion store, sports store, men – women or children store, jewelry store, kitchen or food store, toys store, digital product store, affiliate store or all in one store, the theme will fit any online store you have. 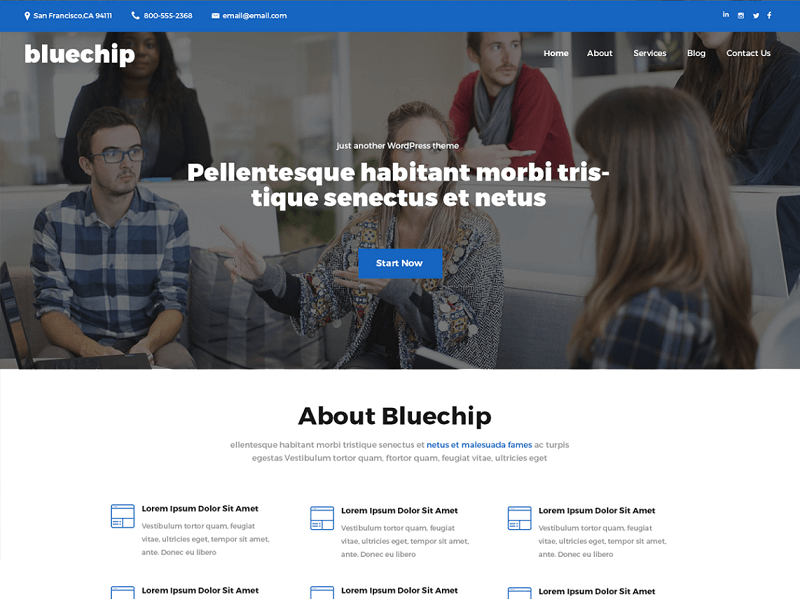 Blue Chip is a clean and contemporary business WordPress theme, with a lot of great functionality right out the box. We’ve added support for popular plugins to manage business contact information, team profiles, and testimonials. Combining the bundled homepage template and the supported shortcodes plugin you can also build highly engaging and interactive home pages just like the demo site. One of the best free popular WordPress themes. Of course, the theme color scheme is also managed via the customizer with no coding required. Perfect for small to medium-sized businesses and professional services organizations like law firms, accounting firms, and consultants. 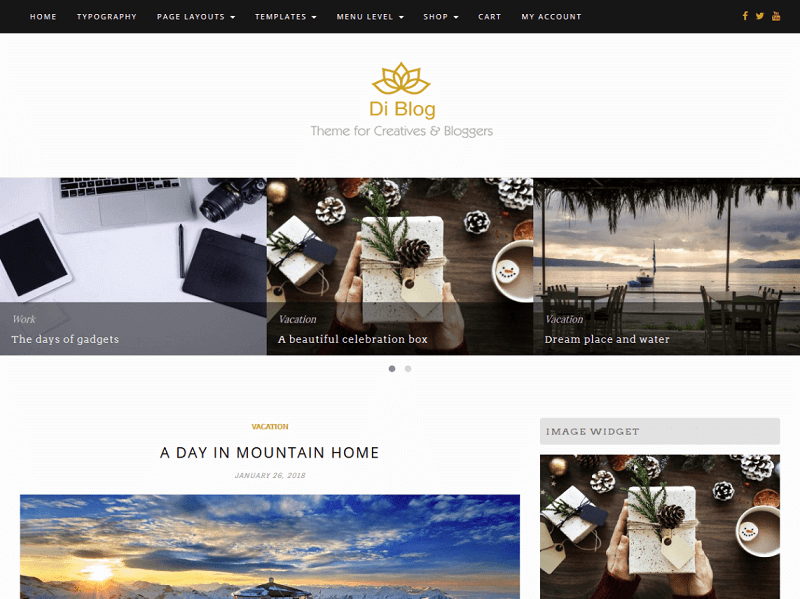 Di Blog is a Clean, Modern, Responsive, SEO Friendly, Customizable and Powerful WordPress Theme for Creatives and Bloggers. Features: One Click Demo Import, Front Page Slider, Typography Options, Social Profile and Icons, Three Level Responsive Main Menu, Sticky Main Menu, Sidebar Menu, Custom Logo, Page Layouts (Full Width, Left Sidebar, Right Sidebar), Advance Footer Widgets with Layout Selection, Footer Copyright Section, Fully Compatible with popular plugin like Page Builder, WooCommerce, Contact Form 7, WordPress SEO etc. 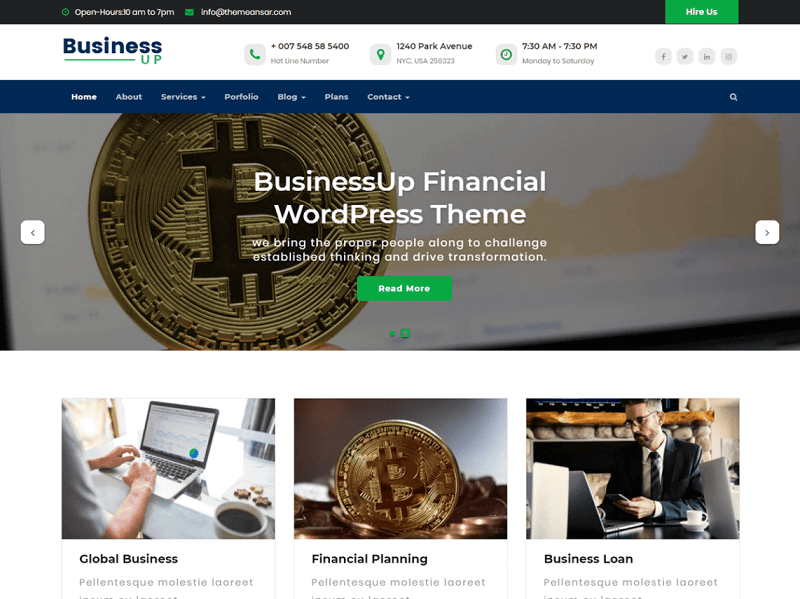 Business up WordPress theme ideal for a business or blog website (corporate, Consulting, Advisor, Agency, Finance, consult, law, Photography, freelancers, online presence etc.). You can also use for anything. It comes with all features this kind of Google Fonts, logo upload, slider, service, blog, shop page, latest news, about us, portfolio, contact us and much more. The theme you can use for any business website. Work with the most popular page builders as SiteOrigin. Developers will love his extensible codebase making it a joy to customize and extend. 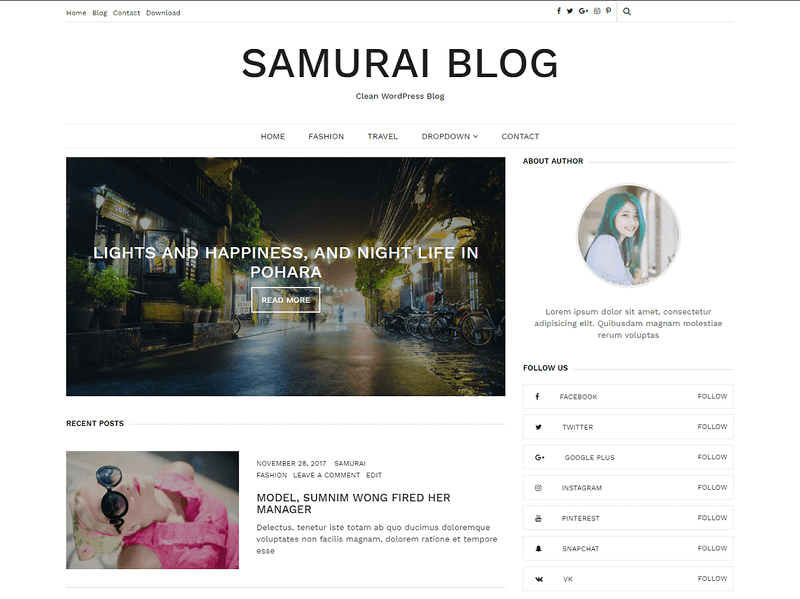 Samurai is a minimal blog theme. This responsive theme is best to use for blog, travel, informative and lifestyle coaches. It comes with the option to change the color of the entire site, author profile widget, social links to connect with social networking sites and more. Samurai Blog Theme Contains Related Post, Featured Section. One of the best free popular WordPress themes. It Supports Popular Plugin WooCommerce, Contacts Form 7, Easy Digital Download. Snowflakes is a Christmas version of our popular Photography WordPress theme – Fotografie. 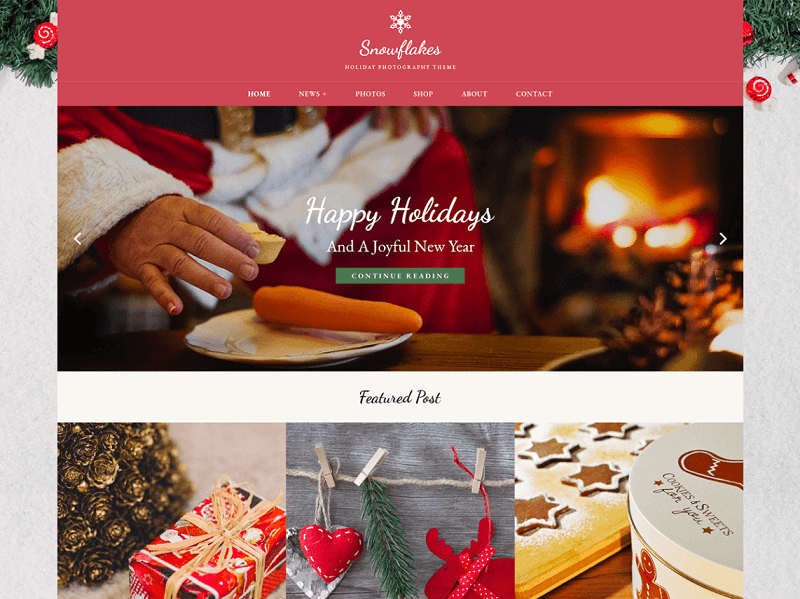 Snowflakes, a child theme of Fotografie is a new Holiday Photography WordPress theme that will give your website a warm and welcoming look and feel of the festival, holiday, Christmas. Snowflakes purely focus on providing your website a festive look with the vibrant color palette. One of the best free popular WordPress themes. Snowflakes provide you with awesome features such as header media options, hero content, portfolio, featured content, color options, menu options and more to create a simple and elegant photography website. 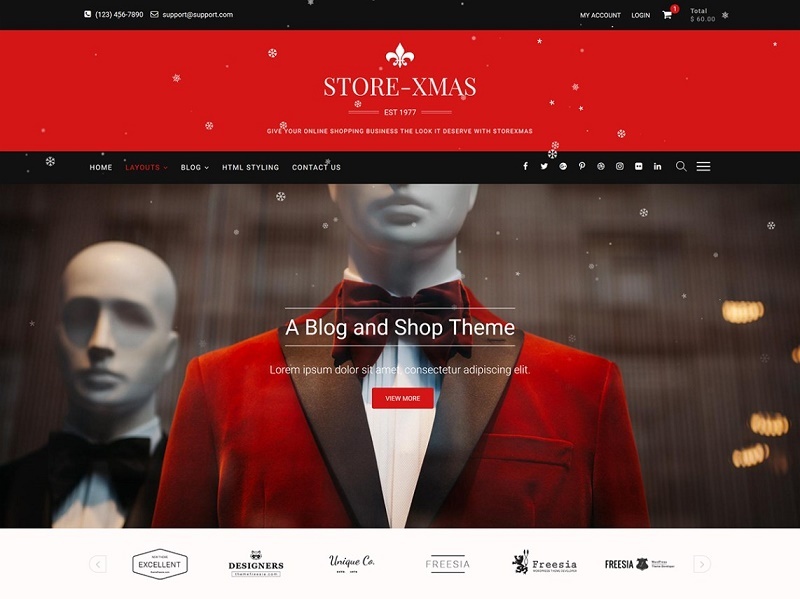 StoreXmas is the next generation and Ultra-Responsive E-commerce, Holiday and Blog WordPress theme, containing all the features you need to create a stunning website. The theme consists of well-organized components so it’s easy to edit and customize everything to create a specific website for your needs. It is designed for Christmas and also competent for every kind of site which is designed and developed by Theme Freesia. With a focus on eCommerce sites, it features multiple sections on the front page as well as widgets, multiple navigation and social menus, a logo, Color Options and more. 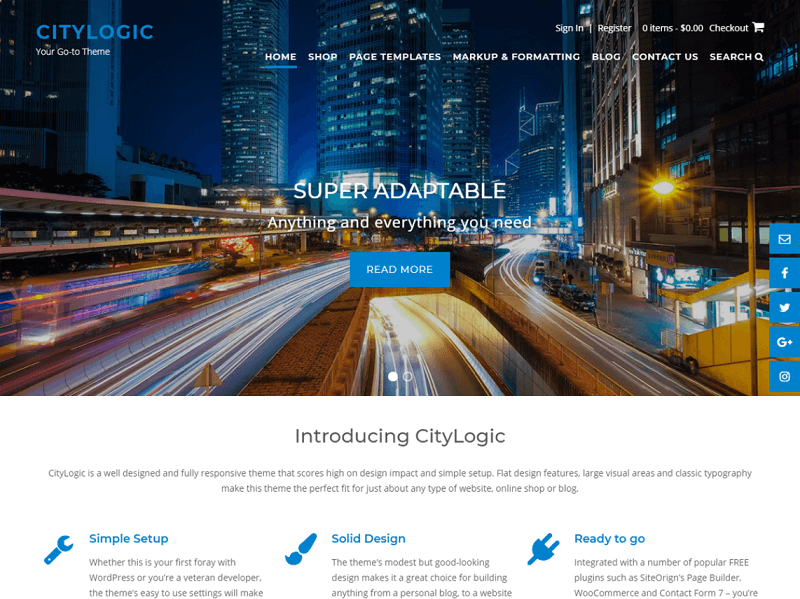 CityLogic’s modest but eye-catching design makes it a great choice for creating any website from travel to business to food, decor, lifestyle, sport and more. One of the best free popular WordPress themes. The ability to have a transparent header allows the use of bold homepage imagery by displaying either a static header image or slider – with the choice of using the built-in slider or any 3rd party slider plugin of your choice. CityLogic integrates seamlessly with a number of popular FREE plugins such as WooCommerce, Contact Form 7 and Recent Posts Widget Extended. It also works great with SiteOrigin’s Page Builder plugin making it quick and easy to create professional looking pages without any coding knowledge. You’re always one step ahead with CityLogic! Krystal is a WordPress theme built for most popular drag and drop page builder Elementor. Krystal comes with 8+ unique demos and with 1 click demo import feature. 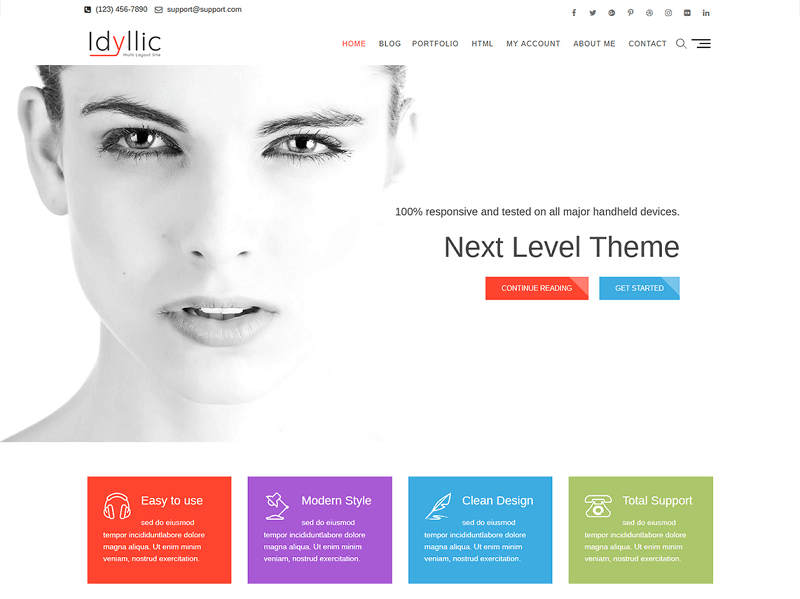 One of the best free popular WordPress themes. Krystal is SEO friendly, mobile responsive, translation ready theme and is compatible with most of the popular plugins. We also provide support for the free version. 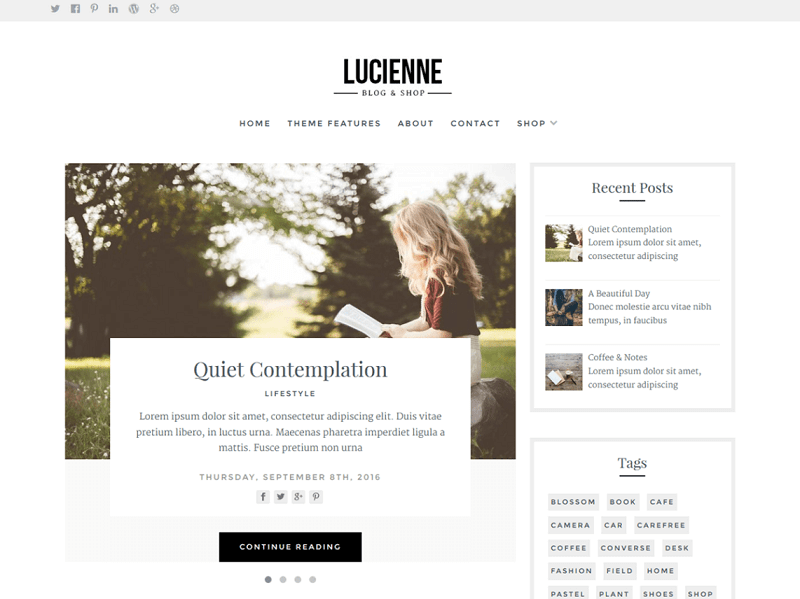 Lucienne is a stylish, elegant and minimal WordPress theme designed for blogs and online shops. It uses whitespace and beautiful typography to present your words, images, and products in style. The homepage features a post carousel which lets you highlight posts from a category on your blog, you can choose the number of posts and also hide this if required. The homepage has areas at the top and bottom so you can add custom content if required. Lucienne works alongside WooCommerce for the shop functionality and also includes styling for other popular plugins like contact form7, Jetpack, Gravity forms and more. 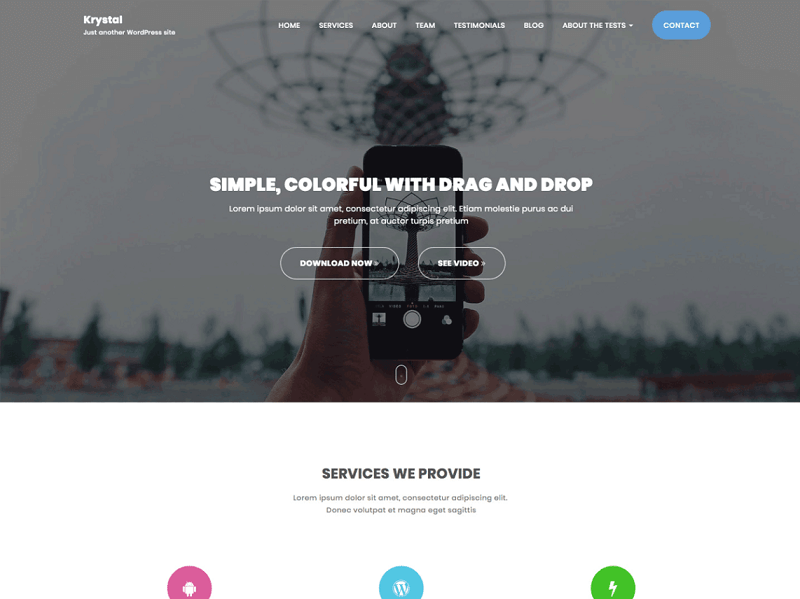 Di Business is a multipurpose, more than responsive, SEO friendly, modern, clean and fully customizable WordPress Theme for professionals. it is fully compatible with all popular page builder plugins and WooCommerce plugin so it can be used to display business information and e-commerce websites. Themes features: One Click Demo Import, Typography Options, Top bar, Header Layouts, Social Profile, Blog Options, Sidebar Menu, WooCommerce Options, Theme Layouts, Footer Copyright Section, Sticky Main Menu Options, Mega Menu Options, Back To Top Icon, Page Preloader, Logo Options, Header Image, Header Left Widget, Header Right Widget, Page Widget, Post Widget, WooCommerce Widget, Footer Widgets with 6 Layouts, Social Profile Widget, Recent Posts with Thumbnail Widget, Translation Ready, SEO Friendly, Structured Data Implemented, Full-Width Page, Full Width for Page Builder, Landing Page Template, Contact Form 7 Ready, Page builder Ready. 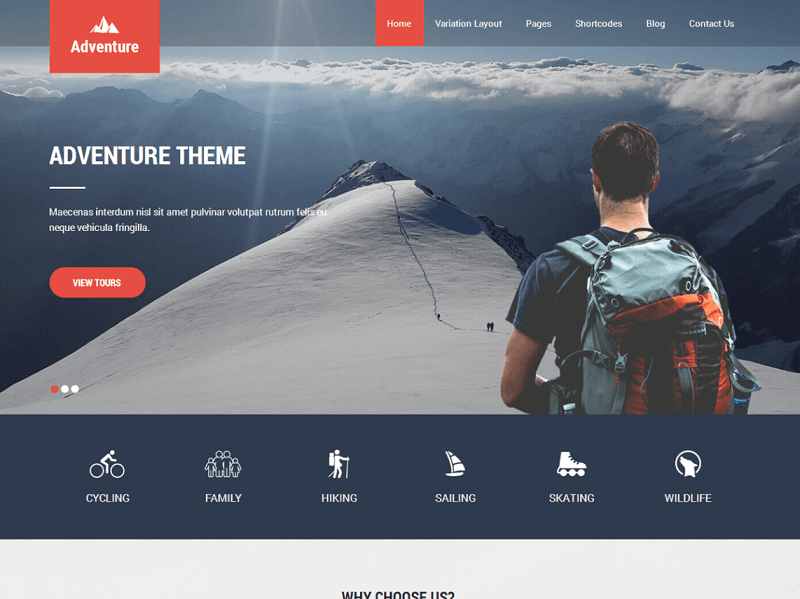 Adventure Lite WordPress theme can be used for adventure, sports, hiking, trekking, sailing, rafting, games, fun, walking, hunting, military, mountain climbing, skiing, surfing, and other such adventure sports. Also can be used for tours and travels, camping, hotel, students, summer camps, skating, motels, service industry, and other corporate, business, photography and personal portfolio websites. Is simple, flexible and multipurpose with having multi-industry use. It is compatible with WooCommerce, and other popular plugins. One of the best free popular WordPress themes. It is also page builder plugins compatible like Elementor, Live Composer, Beaver Builder and multilingual plugins like Polylang, qTranslate X and others too compatible as well. Idyllic is the next generation and Ultra Responsive, Multipurpose, Corporate, Fully Optimized For Agency, Business, Corporate, CV, Personal, Portfolio, Fashion, Fitness, Financial, eCommerce, Event, Services, SEO, Video and Blog or any other type of business WordPress theme, containing all the features you need to create a stunning website. The theme consists of well-organized components so it’s easy to edit and customize everything to create a specific website for your needs. It is designed for Business but this is competent for every kind of site which is designed and developed by Theme Freesia. With a focus on business sites, it features multiple sections on the front page as well as widgets, multiple navigation and social menus, a logo, Color Options and more. 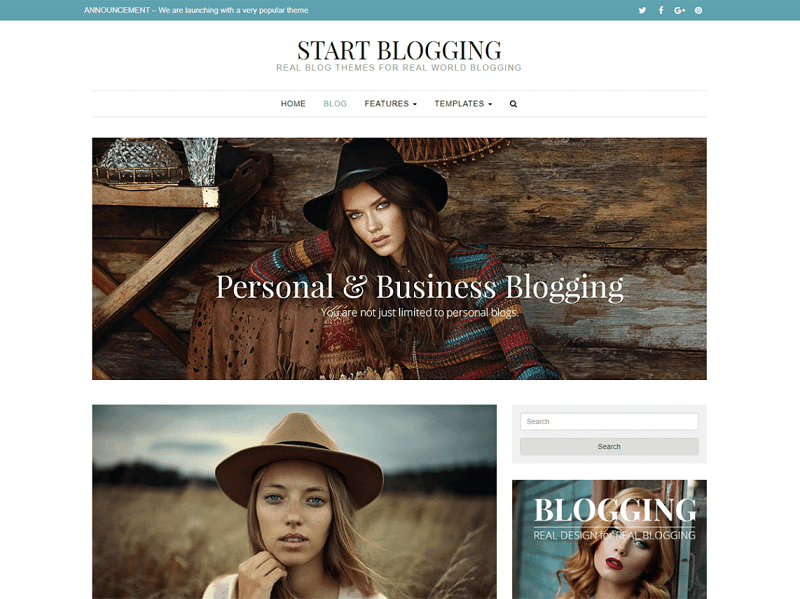 Start Blogging offers you an exceptional style that is designed for personal and business blogging websites. With clean lines, open space, and features like Unlimited Colours, you can easily personalize your website using the powerful built-in theme customizer that lets you see live results as you make changes. This theme focuses more on simplicity to ensure you can maximize what is important.creating content for your blog! To list a few of many key features, you get mobile responsive viewing that includes Responsive Font Sizing, a layout that takes advantage of the ever-popular Bootstrap grid, 20 sidebar positions with dynamic sizing, a theme that is Page Builder ready, Font Awesome icons, a Banner sidebar for images or Sliders, an information page in the Admin to give you access to set up tutorials and support, plus much more. 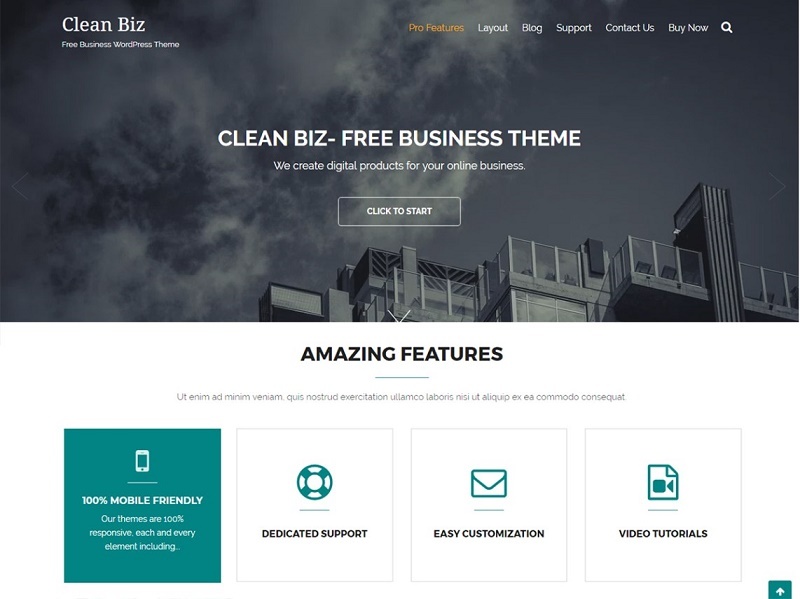 Clean Biz, a dynamic, fast responsive business WordPress theme. Whether you require an eCommerce, Business, Woo-commerce, multilingual shop, responsive layout, retina ready. One of the best free popular WordPress themes. 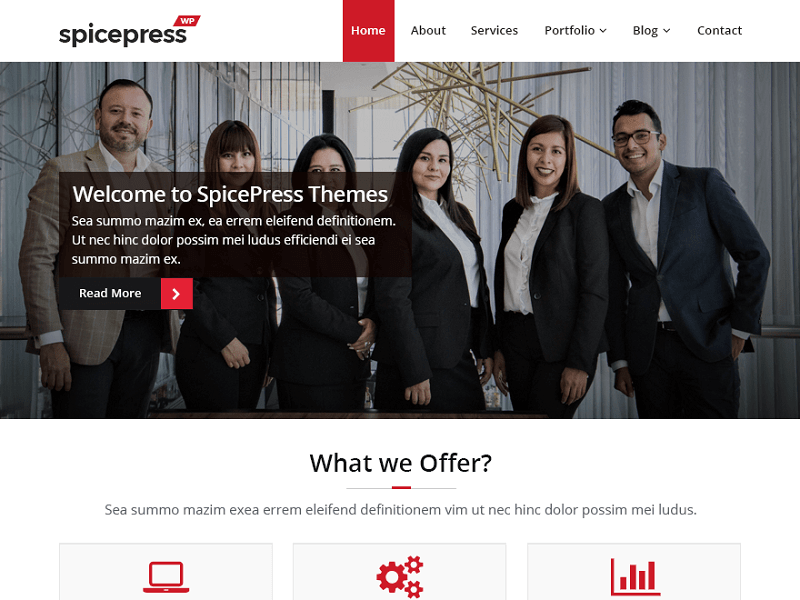 If you want to build your website within a few moments, choose this multipurpose corporate theme. It suits your business. It supports most of the popular themes from the WordPress repository. Compatible with the modern browser like IE 9+, Opera, Firefox, Chrome, Safari including fit in all devices like iPhone, iPad, Android, Tablet, Mac, Desktop etc. This theme is translation ready. 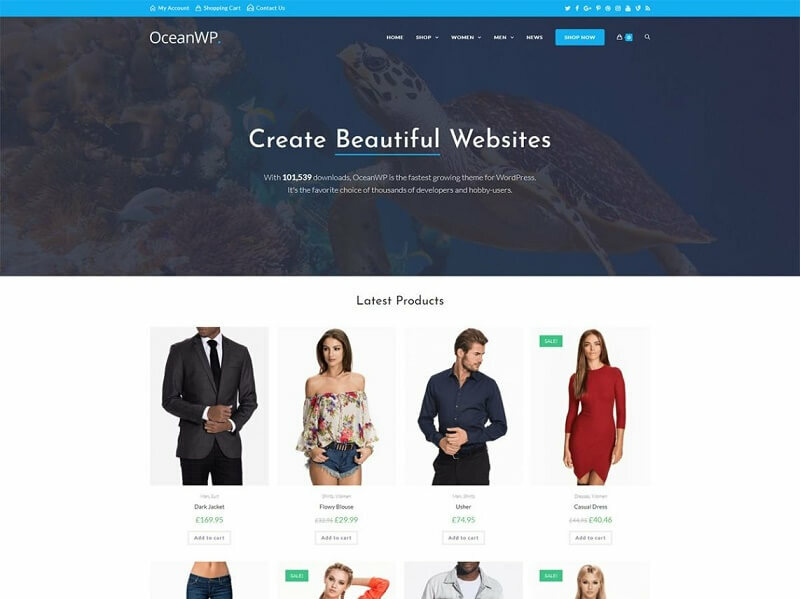 OceanWP is the perfect theme for your project. Lightweight and highly extendable, it will enable you to create almost any type of website such a blog, portfolio, business website and WooCommerce storefront with a beautiful & professional design. Very fast, responsive, RTL & translation ready, best SEO practices, unique WooCommerce features to increase conversion and much more. One of the best free popular WordPress themes. You can even edit the settings on tablet & mobile so your site looks good on every device. Work with the most popular page builders as Elementor, Beaver Builder, Visual Composer, Divi, SiteOrigin, etc… Developers will love his extensible codebase making it a joy to customize and extend. Best friend of Elementor & WooCommerce. 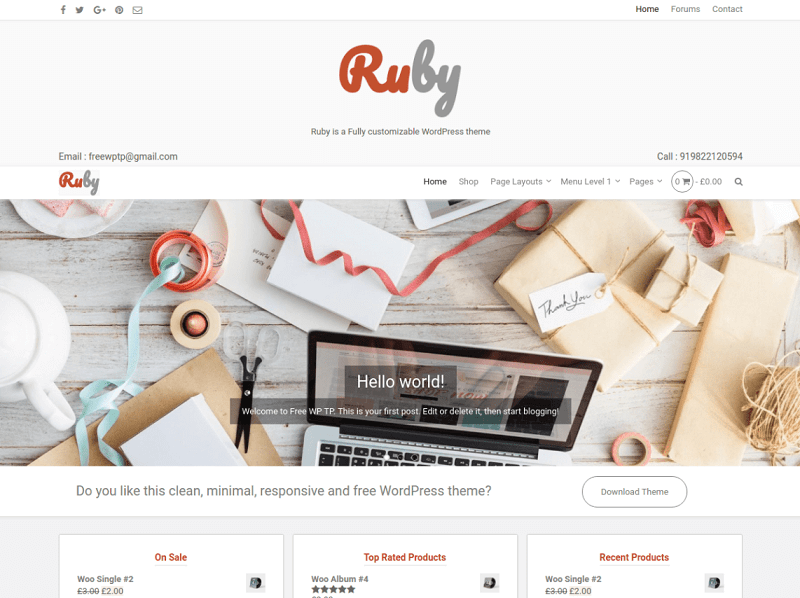 Ruby is a clean, minimal, responsive, fast loading and fully customizable WordPress theme. The theme is built using HTML5, CSS3, Bootstrap 4 and is SEO friendly. One of the best free popular WordPress themes. The theme can be used for anything so be creative and unleash its full potential in blogging, e-commerce, business, and other websites. Many users are using this theme to create their eCommerce site. Some of the nicest features of theme are Social icons, Full-color control, Layout control, Full-screen slider, Custom logo, Header image, Header video, Background image, Translation ready (compatible with WPML plugin), Google fonts, Sticky navigation, Four widget areas, Action buttons and many more. 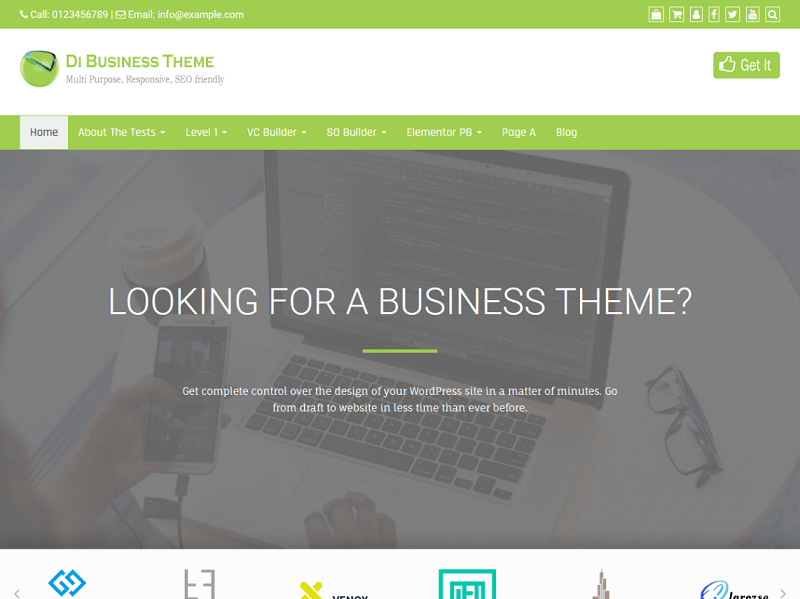 The theme out-of-the-box plays nicely with WooCommerce, Jetpack, bbPress, BuddyPress, WP-PageNavi, Breadcrumb NavXT, Contact Form 7 and other popular free and premium plugins. 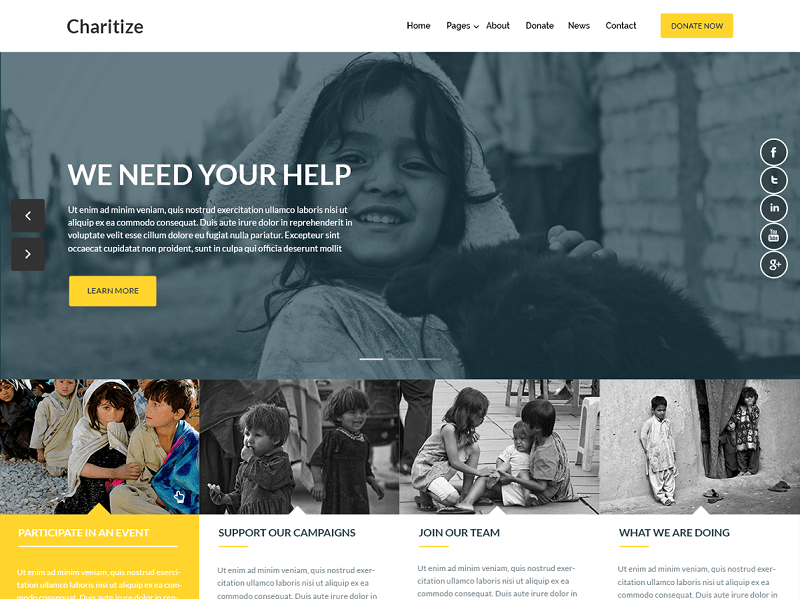 A simple & clean WordPress theme for all Non-Profit Organizations, Non-Profit Associations, Foundations or churches, political parties etc. With lots of customization features, you can easily build a professional website for your organization. 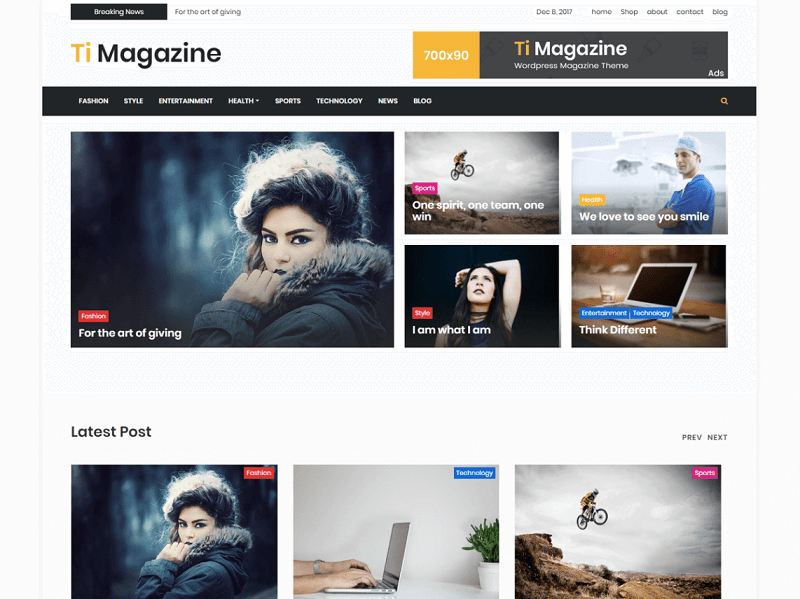 One of the best free popular WordPress themes. This theme supports most of the popular plugins like contact form 7, jetpack, PS sitemap etc.